Mortgage markets improved last week ahead of Memorial Day and a 3-day weekend. Bond pricing ending the week higher, pushing conforming mortgage rates in California down for the 5th week out of six. Most economic news reported worse-than-expected. Initial Jobless Claims increased sharply, GDP was unchanged, and Durable Orders posted the largest one-month decline since October. Each of these stories reduced inflationary pressures on the economy, contributing to lower mortgage rates. However, the main driver for U.S. mortgage rates last week was Europe. One year ago, Greece pledged to lower its spending, cut its deficit, and reduce the number of public programs and benefits. In economic circles, this is known as austerity. For more than a month, however, despite the austerity measures, there has been concern that Greece will fail to meet its debt obligations. Last week, that concern spiked. It triggered a flight-to-quality that helped U.S. mortgage bonds, and led mortgage rates lower. Conforming and FHA mortgage rates are now at their lowest levels in more than 6 months. 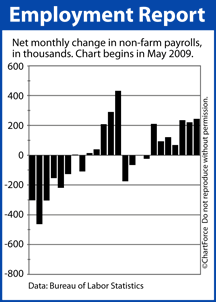 This week, the biggest news is May’s Non-Farm Payrolls report. Although, expect for rates to carve out wide ranges from day-to-day. Until the Greece scenario reaches a resolution, Wall Street will be on edge. Plus, four members of the Fed have scheduled speeches. If you’re still floating a mortgage rates, or have otherwise not locked in, luck is on your side. 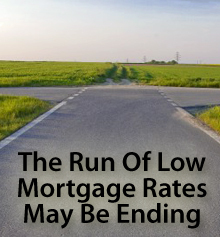 Mortgage rates look poised to fall over the next few days, however, markets have been known to reverse quickly. Therefore, if you’ve been quoted on a rate that looks acceptable to you, you may not want to gamble on mortgage rates falling further. The safest decision may be to commit to what’s available to you today. Home affordability moved higher last quarter, buoyed by stable mortgage rates and falling home prices in California and nationwide. The National Association of Home Builders reports that Q1 2011 Home Opportunity Index reached an all-time high for the second straight quarter last quarter. Nearly 3 of 4 homes sold between January-March 2011 were affordable to households earning the national median income of $64,400. It’s the 9th straight quarter in which home affordability surpassed 70 percent, and the highest reading in more than 20 years of record-keeping. From metropolitan area-to-metropolitan area, though, affordability varied. In the Midwest, for example, affordability was high. 7 of the 10 most affordable markets were in the Midwest, including Kokomo, Indiana, in which 98.6% of homes were affordable to median income-earning families. Indianapolis, Indiana placed second for “big city” affordability. The most affordable “big city” last quarter was Syracuse, New York. With a 94.5% affordability rate, Syracuse ranks 8th nationally in the Home Opportunity Index. It’s the second time that Syracuse placed first in the last 4 quarters. Meanwhile, on the opposite end of home affordability, the “Least Affordable Major City” title went to the New York-White Plains, NY-Wayne, NJ area for the 12th consecutive quarter. Just 24.1 percent of homes were affordable to households earning the area median income, down more than 1 percent from the last reading. Regardless of where you live, remember that rising mortgage rates can levy more pain on your household budget than can rising home values. And mortgage rates are expected to rise long before home prices do. Home values dropped for the sixth straight month in March 2011, according to the Federal Home Finance Agency’s Home Price Index. The Home Price Index is a government-sponsored home value tracker. The HPI report is the latest in a string of “falling home values” stories — a trend that’s troubling home sellers across Rancho Santa Margarita and nationwide. However, although the Home Price Index says home values are falling, that doesn’t necessarily mean that they are. Like most statistics in the housing sector, the Home Price Index is plagued by poor methodologies and a lack of timeliness. In short, the Home Price Index is flawed. In three ways. The first big flaw in the Home Price Index is that it only measures the values of homes with mortgages backed by Fannie Mae or Freddie Mac. Homes financed via FHA, or via other means are specifically excluded from the calculation. For today’s purchase market, that leaves more than 1 in 4 homes “uncounted” — a big percentage of the market. Second, the Home Price Index determines home values by measuring price change from sale to subsequent sale. This eliminates new homes — a major market segment. And, lastly, the Home Price Index reports on a 60-day delay; we’re only now seeing data from March. This two-month lag renders the HPI a trailing indicator for the housing market instead of a forward-looking one. If you’re a home buyer looking for market insight, the HPI can’t give it — it’s out-dated and out of season. Despite its shortcomings, though, we can’t ignore the Home Price Index completely. It’s among the most thorough home valuation models available, and it’s used in public policy discussions. When the HPI says prices are down, Wall Street and Capitol Hill take notice, and that trickles down to everyday life on Main Street. 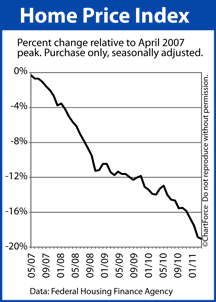 Since peaking in April 2007, the Home Price Index is off 19.1 percent. In addition, the supply of new homes dropped to 6.5 months — a 2-month decrease from October 2010 and the best reading in a year. The report runs counter to recent reports from the National Association of Homebuilders and the National Association of REALTORS® which suggest a looming housing slowdown. April’s New Home Sales report runs counter to that theory; it shows ongoing, steady, staggered improvement in terms of sales volume and sales inventory. These figures suggest that that move-up buyers — not first-timers — are driving the new home market. Homes under $200,000 now account for just 40% new home sales, down from 46% a year ago. However, as with most months, it’s important that we recognize the New Home Sales data’s margin of error. Although New Home Sales showed a 7% improvement in April, the reported margin of error was ±17%. This means that the actual reading could have been as high as 24 percent, or as low as -10 percent. It’s a huge range, and because it encompasses both positive and negative values, the Census Bureau assigned its April reading “zero confidence”. It’s right there in the footnotes. For home buyers in Rancho Santa Margarita , rising sales and falling supply may mean higher home prices. And, combined with the issuance of fewer building permits, supplies may be constrained into the summer months. This, too, would pressure home prices higher. Mortgage rates across the state are near year-to-date lows, but locking them in this week may be difficult. As Memorial Day nears, and Wall Streeters get a head-start on the long weekends, trade volume in the mortgage bond markets will dip. When bond volume drops, mortgage rates get jumpy. It’s a relationship based more on scarcity than actual market fundamentals. As Friday gets closer this week, and more and more Wall Street traders will leave for their “extended” 3-day weekend, and bond markets will be left with fewer and fewer participants. This will create a market situation in which it’s harder to match a buyer and seller at any given bond price, resulting in larger mortgage rate shifts than usual. These jumps in rates are exaggerated during periods of economic uncertainty like these. What’s more, there’s a lot of economically-important data due for release this week. That, too, can put markets in hysterics. If this were a “normal” week, mortgage rates would be volatile. The coming of Memorial Day is just adding to the mix. Mortgage rates may rise in Coto de Caza this week, or they may fall. Either way, if you have the opportunity to lock something favorable, consider doing it. Rates are low and likely won’t last. Mortgage markets were unchanged last week, despite improving on four of five days. Economic data was worse-than-expected almost across the board, but neither FHA nor conforming mortgage rates in California budged. Instead, markets grappled with the just-released Fed Minutes which weighed heavily on investors and on Wall Street.With the release of the minutes, it’s increasingly clear that the Federal Reserve will end its support for bond markets on schedule in June, and that a Fed Fund Rate hike is possible within the next 12 months. Not surprisingly, the date of the Fed Minutes release — Wednesday — was the singular “down day” for mortgage markets last week. After falling for 4 straight weeks, Coto de Caza mortgage rates appear to have troughed. This week they could rise, and there’s no shortage of data on which for bonds for trade. There’s other forces on markets, too. First, there are 3 bond auctions — a 2-year, a 5-year, and a 7-year. Weak demand for any of the three will lead mortgage rates higher. And, second, this is a holiday week. Memorial Day is next Monday and, with the 3-day weekend ahead, expect large numbers of Wall Streeters to skip out on Friday (and likely part of Thursday, too). As the week concludes, therefore, bond volume will thin, amplifying mortgage rate movement — up or down. If you’re shopping for a mortgage, it’s a good time to look at locking in. As the week progresses, mortgage rates should become less predictable and more volatile. The housing market recovery stalled last month. At least temporarily. According to the National Association of REALTORS®, Existing Home Sales slipped 1 percent in April from the month prior, falling to 5.05 million units on a seasonally-adjusted, annualized basis. The reading is exactly in-line with report’s 6-month average which also reads 5.05 million units. The data may appear “average”, but there’s another angle to consider. In April, as compared to March, the supply of existing homes for sales spiked. 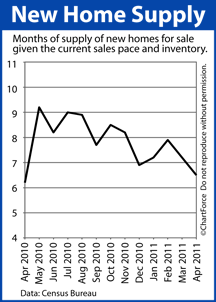 At the current pace of home sales, it would now take 9.2 months to exhaust today’s complete home inventory. This is almost one full month worse than March. It’s the worst home supply reading of the year. There are also more homes “on the market” today than at any time since September 2010. This “discount”, it should be noted, is a major reason why distressed properties accounted for 37 percent of the home resales in April. Home buyers are finding bargains when they’re willing to consider homes in various stages of foreclosure and short sale. Overall, the April Existing Home Sales report represents opportunity for home buyers in and around Coto de Caza. Home sales are stagnant, supplies are rising and there’s no shortage of properties from which to choose. Furthermore, mortgage rates remain low. If you’re considering a home purchase this fall, home supply may not be as ample, and financing conditions may not be as favorable, post-Labor Day. Talk to your real estate agent about what’s possible today. You may want to move up your time frame. The Federal Reserve released its April 2011 Federal Open Market Committee meeting minutes Wednesday. In the hours since, mortgage markets have worsened; rates in California are higher by 1/8 percent this morning, at least. 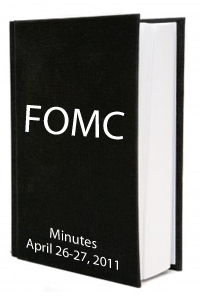 The “Fed Minutes” is published 8 times annually, three week after each scheduled FOMC meeting. The minutes are the Federal Reserve’s official recap of the conversations and debates that shaped the prior FOMC session. Another way to consider the Fed Minutes is as the companion piece to the more well-known FOMC press release. The press release is issued on the day of adjournment, and is brief, narrow, and high-level. The statement makes broad comments on the economy and outlines new monetary policy. By contrast, the Fed Minutes is delayed, lengthy, and rife with details. The minutes highlights arguments and discussion points between Fed members, and digs deep into underlying economic issues. The FOMC press release is measured in paragraphs. The Fed Minutes is measured in pages. On housing : The market remains depressed. “Vacant properties” are harming construction. In addition, at its meeting, the Federal Reserve discussed an exit strategy for its market support. The details are undecided, but the debate shows that the Fed is anticipated a change in policy sometime soon. Wall Street estimates that a gradual economic tightening will begin within 12 months. Mortgage rates have been fading since mid-April. The Fed Minutes may be the catalyst of a reversal. The Federal Reserve expects growth in the U.S. economy and growth tends to boost stock markets at the expense of bonds. As bond markets fall, mortgage rates in Rancho Santa Margarita rise. Currently, Freddie Mac reports the average 30-year fixed mortgage rate as 4.63% — the lowest of the year. Single-family housing starts dropped by 21,000 units in April on a seasonally-adjusted annual basis. The Housing Starts report measures the number of homes on which new construction “broke ground”. It’s tracked by the U.S. Department of Commerce which releases new data monthly. Single-family housing starts fell 5 percent as compared to March 2011, and 30 percent as compared to April one year ago. The figures were worse than what Wall Street expected. For just the second time in 2 years, monthly single-family housing starts dropped below 400,000 units. In addition, single-family Building Permits fell in April as well, shedding 2 percent from March. A building permit is a local government’s approval to start home construction and when permits are down, new construction follows. This is because 93 percent of homes begin construction within 60 days of permit-issuance. 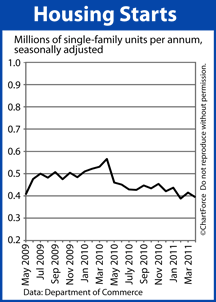 Fewer permits, as a consequence, means fewer new homes. Therefore, if you’re looking at new construction in or around Trabuco Canyon , April’s numbers may spark a sense of urgency. Home prices are a function of home supply and demand and, based on the Housing Starts data, supplies appear headed for a fall. Meanwhile, on the other side of the equation, demand should be rising — foot traffic is higher, mortgage rates are lower, and job growth is picking up. This should lead new home prices higher in time. 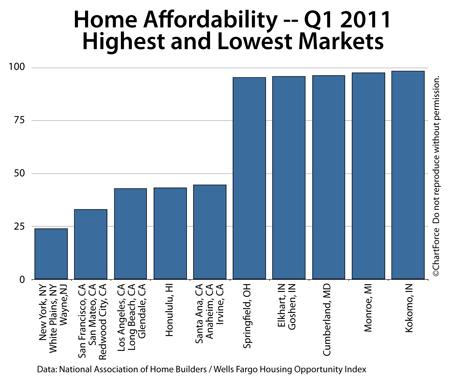 For now, though, home affordability remains high. It’s a good time to look at new home construction. Foreclosure filings in California have fallen to lows not seen since fall 2008. 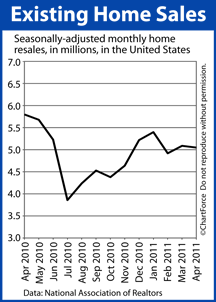 Foreclosure activity slowed in April. Foreclosure filings were down in Arizona, California, Nevada and Washington, with Oregon being the sole exception where filings were up. California filings were down to levels not seen since late 2008, when governmental intervention caused a temporary but massive drop in activity. Foreclosure sales saw similar declines throughout our coverage area, except Washington. Notably, cancellations were up significantly across the board, leaving fewer properties scheduled for trustee sale. Foreclosure filings in California fell to lows not seen since the fall of 2008. Notice of Default filings dropped 25.8 percent, and Notice of Trustee Sale filings fell 10.9 percent from March. On a year-over-year basis foreclosure filings were down as well, with Notice of Default filings down 28.0 percent and Notice of Trustee Sale filings falling 31.2 percent from April 2010. Foreclosure sale cancellations rose 27.0 percent from March. Activity on the courthouse steps slowed from the prior month, with 17.2 percent fewer sales Back to Bank and a 15.8 percent drop in properties purchased by 3rd Parties, typically investors. The average Time to Foreclose continued to climb, increasing 3.3 percent to 312 days. So, fewer foreclosure initiations, and more cancellations of trustee sales which had previously been scheduled, is all positive information, showing that the local – California – real estate market really does appear to be stabilizing. If you’d like to talk about conditions in YOUR neighborhood, please give me a call, or shoot me an email, and “Let’s Talk About Real Estate”. Comments Off on Foreclosure filings in California have fallen to lows not seen since fall 2008.